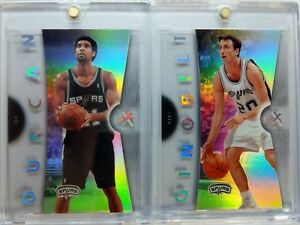 Lot of 2: 2006 06/07 FLEER EX SPURS MANU GINOBILI ACETATE Premium, RARE!!! Lot of 2: 2006 06/07 FLEER EX NETS VINCE CARTER ACETATE Premium, RARE!!! 1997 97-98 E-X2001 Tim Duncan #75, Rookie RC, Acetate Rare, San Antonio Spurs! 1997 97-98 Flair Showcase Row 2 Tim Duncan #5, Rookie RC! Spurs! Sharp! Nice card; shipped promply and well packaged - great service, thank you! Easy transaction and accurate description! Great item, Fast shipping, great seller! !